THROUGH MAY 5: BLOOM! An exhibit featuring the beauty of nature in the spring. 10 a.m. to 5 p.m., Wednesday and Thursday; 10 a.m. to 7 p.m., Friday and Saturday; 1-5 p.m., Sunday. R.W. Norton Art Gallery, 4747 Creswell Ave., Shreveport. Call 865-4201. THROUGH MAY 31: "DEPTH OF FIELD" A PHOTO EXHIBIT. Featuring the work of Maria Schmelz and Ron Austin. Bossier Arts Council, 630 Barksdale Blvd., Bossier City. Visit www.bossierarts.org. APRIL 17-MAY 3: LOUISIANA: A PARADISE FOR BIRDS. This photography exhibit is on birds by Dr. Charles Lyon. An opening reception is from 2-4 p.m., April 17. Louisiana State Exhibit Museum, 3015 Greenwood Road, Shreveport. Visit www.laexhibitmuseum.org. APRIL 25: BIZ ART. A free family event featuring a local artists. 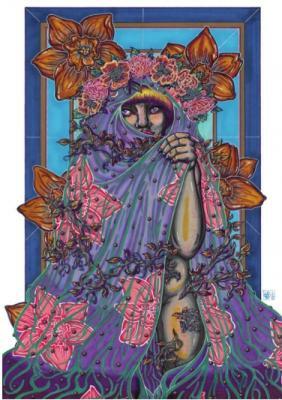 April’s artist of the month is Adena Helm. 5-7 p.m. Hayter Reynolds, LLC, 9045 Ellerbe Road, Ste. 103, Shreveport. Call 698-3000. AGAVE: No cover. Happy hour Friday and Saturday, 5 to 7 p.m. 2-for-1 well, wine & draft. Dorsey Summerfield, 6-10 p.m., April 11; Sweet T, 8 p.m. to midnight, April 12, 13; Chris McCaa, 6-10 p.m., April 18; Total Choice, 8 p.m. to midnight, April 19, 20; Beaux Atkins, 6-10 p.m., April 15; Legato Stone, 8 p.m. to midnight, April 26, 27. Diamond Jacks Casino & Resort, 711 DiamondJacks Blvd., Bossier City. 678-7777. AMERICAN LEGION #14: Karaoke with Jay Couger or Dickie Turner 5:30 p.m. every Sunday. 5315 Lakeshore Drive, Shreveport. 635-8186. BAYOU THUNDER SALOON. 5 Star Karaoke Plus with Ed Williams from 6-11 p.m. every Sunday. 5 Star Karaoke Plus, 8 p.m., Friday. 1910 Market St., Shreveport. 848-7732. Shreveport. BON TEMPS COFFEE BAR: Every Thursday from 7-10 p.m. is Thursday Night Vibes with local singers, songwriters, musicians and performers. Saturday night is poems and songs that pairs poems with smooth backing music from 7:30 p.m. to midnight. 450 Clyde Fant Memorial Parkway, Ste. 700, Shreveport. 734-9766. CELEBRITY LOUNGE: Safira Live Band Karaoke, 8 p.m. April 11, 25; Southern Roots, 9 p.m., April 12; DJ Konflikt, 10:30 p.m., April 13; Soul Grooves, 8 p.m., April 18; Mojiles, 9 p.m., April 19; Super Fleek, 9 p.m., April 20; The Wonderfuls, 9 p.m., April 26; DJ Trentino, 10:30 p.m., April 27. Eldorado Resort Casino, 451 Clyde Fant Parkway. Call 877-602-0711. COYOTES BAR & GRILL. 5 Star Karaoke Plus 8 p.m. to midnight every Monday; 9 p.m. to 1 a.m. every Saturday. 1618 Market St., Shreveport. 424-0650. CRYSTAL STAIRS: 601 Texas Street, Shreveport. 424- 8783. EL POTRILLO MEXICAN RESTAURANT: Wayne’s FM Karaoke, 6-10 p.m. Tuesdays. 6614 Youree Drive, Shreveport. END ZONE SPORTS BAR: 1 p.m. to 2 a.m., Monday through Saturday. Happy hour daily from 1-8 p.m. 5 Star Karaoke Plus 9 p.m. to midnight every Thursday. Shuffleboard and pool table. 2216 Benton Road, Bossier City. Call 747-2773. FRIDA'S: 200 Travis St., Shreveport. 208-8600. GREAT RAFT BREWING: Open every Wednesday through Friday from 4 to 9 p.m. and Saturday from noon to 9 p.m. Free tours are available at 1 p.m., 2 p.m. and 3 p.m. on Saturdays. 1251 Dalzell, Shreveport. Call 734-9881. H&H LOUNGE: Good vibes night every Wednesday. Drum Circle, 6-9 p.m.; VJ-DJ music, 9 p.m. to midnight. 717 Hope St., Shreveport. 424-9297. LEGENDS THEATRE: DiamondJacks Casino & Resort, 711 DiamondJacks Blvd., Bossier City. 678-7777. MUDDY WATERS SPORTS BAR: 5 Star Karaoke, April 10, 17, 24; Stereodrive Band, April 13; Wes Jeans Band, April 19; Tambria Adams Band, April 26. 5000 Benton Road, Bossier City. 741-7635. NICKY'S MEXICAN RESTAURANT: Wayne’s FM Karaoke, 6:30-10 p.m., Thursdays; Richard Cook, March 29; Ambush, April 20. 2701 Viking Drive, Bossier City. 841-1345. NORTHWOOD HILLS GOLF CLUB CLUB HOUSE Live music with Wayne’s FM Karaoke, every last Saturday of the month. 5000 Northwood Hills Drive, Shreveport. 797-9556. OUR PLACE BAR & GRILL: 5 Star Karaoke Plus 8 p.m. to midnight every Friday and 2:30-6:30 p.m. every Sunday. 300 Cryers Camp Road, Elm Grove. 987-3334. SAM'S TAVERN: 5-Star Karaoke Plus every Friday and Saturday from 7-11 p.m. Located at 3816 E. Texas St. in Bossier City. 318-658-9804. SAM'S TOWN LIVE ENTERTAINMENT: Free entertainment all month long. Ambush, 7 p.m. to midnight, April 12. 315 Clyde Fant Parkway, Shreveport. 877-429-0711. THE STAGE AT SILVER STAR: Live entertainment. Gates open at 7 p.m. unless stated otherwise. 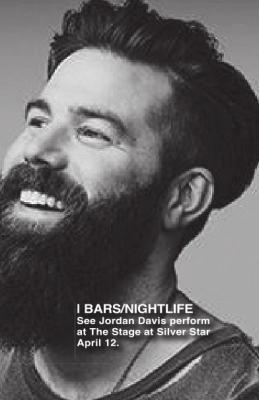 Jordan Davis + Jared Mourad, April 12; Eli Young Band, May 4; Parker McCollum, May 10; Delbert McClinton, May 17; Cowboy Mouth + Spectra Vamp, July 20. 1201 Dixie Overland Road, Bossier City. 752-3633. Tickets available at www.outhousetickets.com. STREAKER LOUNGE. 2245 Grimmett Drive, Shreveport. 226-6555. SUNDANCE CANTINA BAR AT BOOMTOWN: Live music is from 8 p.m. to midnight; 5 Star Karaoke Plus featuring Ed Williams, 7-11 p.m., every Wednesday night; Professor Porkchop & The Dirty Dishes, April 12, 13; Pseudo Boom, April 19, 20; Lady Chazz & The Champs, April 26, 27. 300 Riverside Drive, Bossier City, La. 318-746-0711. SUPERIOR GRILL: Live entertainment on the patio from 6:30-10:30 p.m., Jimmy Wooten Band, April 10; Scram Wulfie and Lefty, April 11; Tambria Adams Band, April 12; Joe Nadeau Band, April 13; Jason Sepulvado Band, April 17; Fine China, April 18; Savage Trio, April 19; Good News Band, April 20. 6123 Line Ave., Shreveport. 869-3243. WHISKEY ROADHOUSE: Hours are noon to midnight Sunday; 6 p.m. to midnight Monday through Thursday; 4 p.m. to 2 a.m. Fridays and Saturdays. K94.5 Wednesday Night Trivia with Know It All Trivia, April 10, 17, 24; Hurricane Joe, April 11; What The Funk? !, April 12; Heather Linn and The Deacons, April 13; Sunday Funday with DJ Love, April 14, 21, 28, 31; ’90s Nite Out with That Girl DJ, April 15, 22, 29; Pro Karaoke with Scott, April 16, 23; Jay Statham and the Tokie Show, April 18; Smackwater, April 19; Kid Icarus Project, April 20; NFL Draft Party, April 25; Come To Life, April 26; Iron Rations, April 27; Flashback 5, April 30. Horseshoe Casino, 711 Horseshoe Blvd., Bossier City. APRIL 11-14: A MIDSUMMER NIGHT'S DREAM. Though the story has been told countless times, Bossier Parish Community College’s unique twist on the timehonored tale is sure to entertain. $12. 7:30 p.m., 2 p.m., Sundays. Stephen W. Slaughter Theatre in Building C on the BPCC campus, 6220 East Texas St., Bossier City. Visit www.bpcc.edu. APRIL 11: BEAUTIFUL CHAOS: A MODERN TRAGEDY OF R+J. Set over a period of four years, the show focuses on the lives of two young men: Rome and Julian, whose lives are forever changed when they meet at camp one summer. Show not suitable for younger audiences. Free. 7:30 p.m. Marjorie Lyons Playhouse, 2700 Woodlawn Ave., Shreveport. APRIL 18-21, 26-28: THE FANTASTICKS. The world’s longestrunning musical that focuses on two young lovers, their meddling fathers, and the journey we all must take through adolescence. $25. 7:30 p.m.; 2p.m., Sundays. Shreveport Little Theatre, 812 Margaret Place, Shreveport. Call 424-4439. 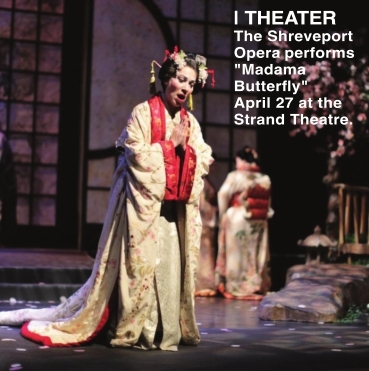 APRIL 27: MADAMA BUTTERFLY. Shreveport Opera presents Puccini's beloved operatic masterpiece. $35-$95. 7:30 p.m. The Strand Theatre, 619 Louisiana Ave., Shreveport. Visit www.shreveportopera.org. 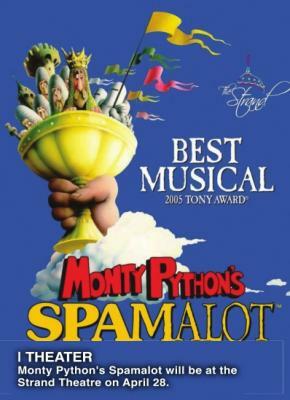 APRIL 28: MONTY PYTHON'S SPAMALOT. "Spamalot" tells the legendary tale of King Arthur and the Knights of the Round Table and their quest for the Holy Grail in seriously ridiculous Monty Python style! This hilarious spoof features a chorus line of dancing divas and knights, flatulent Frenchmen, killer rabbits and one legless knight. $25, student, $44, $61, $75. The Strand Theatre, 619 Louisiana Ave., Shreveport. Visit www.thestrandtheatre.com. APRIL 10: PIONEERS OF ROCK'N SOUL. Bill Buchanan pays tribute to the '50s and '60s icons. $20-$25. 7-9 p.m. East Bank Theatre, 630 Barksdale Blvd., Bossier City. Visit www.eventbrite.com. APRIL 12: A TRIBUTE TO THE QUEEN OF SOUL. Extensions of Excellence Performing Arts presents this performance for Aretha Franklin. $15. 7:30 p.m. The Strand Theatre, 619 Louisiana Ave., Shreveport. Call 226-8555. APRIL 13: JEFFERSON STARSHIP. With original members David Freiberg and Donny Baldwin, along with longtime members Chris Smith, Jude Gold and Cathy Richardson anchoring the female lead vocal spot made famous by Grace Slick. $25, student; $32, $42, $52. The Strand Theatre, 619 Louisiana Ave., Shreveport. Visit www.thestrandtheatre.com. APRIL 25: LAUREN DAIGLE. American contemporary Christian music singer and songwriter takes the stage at 7:30 p.m. at Shreveport Municipal Auditorium. Tickets are $27.50-$87.50 and are available at Shreveport Convention Center box office Mon.-Fri. Tickets may be purchased online at Ticketmaster.com or charge by phone (800)745-3000. MAY 11: CHONDA PIERCE - STILL LAUGHING. Featuring Karyn Williams. $26, $36, $49.50. 7 p.m. Shreveport Municipal Auditorium, 705 Elvis Presley Ave., Shreveport. Visit www.shreveportmunicipalauditorium.com. EVERY TUESDAY THROUGH MAY: EAST BANK MARKET. A celebration of local vendors, handcrafted goods, artists, food and small business to include live music, fun family activities and more. 4-7 p.m. East Bank District and Plaza, 630 Barksdale Blvd., Bossier City. Visit www.EastBankMarket.com. EVERY SATURDAY AND SUNDAY: THE HISTORIC OLGILVIE- WIENER HOME. Come take a step back in time and visit this beautiful Queen Anne Victorian mansion and watch the progress of historic preservation of this magnificent home. $10. 4-6 p.m. 728 Austen Place, Shreveport. EVERY SATURDAY: FREE COMMUNITY WORKOUT. With Camp Gladiator-certified personal trainers. One-hour total body workout for all ages and levels. 8 a.m. Bossier Parish Community College, 6220 E. Texas St., Bossier City; 9 a.m., Betty Virginia Park, 3901 Fairfield Ave. Visit www.campgladiator.com. FIRST THURSDAY OF THE MONTH: MOMMY & ME YOGA. This 30-minute class is filled with songs, laughter, stories and yoga and created for mommy and baby bonding. $5. 10 a.m. R.W. Norton Art Gallery, 4747 Creswell Ave., Shreveport. Visit www.rwnaf.org. EVERY SATURDAY BEGINNING APRIL 6: BOSSIER CITY FARMERS' MARKET. With fresh foods, honey, soap, makers, entrepreneurs, artists, food trucks and fun activities for kids. Free. 9 a.m. to 1 p.m. Pierre Bossier Mall, 2950 East Texas St., Bossier City. Visit www.BossierCityFarmersMarket.com. APRIL 11, 25, 28, MAY 2: JAM ON THE RED CONCERT SERIES. Features some of the most talented regional rock bands for the ultimate destination for a Thursday night happy hour! Rock out at this weekly outdoor music festival in the courtyard. Food and beverage will be available for purchase. 5:30-9 p.m. Shreveport Aquarium, 601 Clyde Fant Pkwy., Shreveport. Visit www.shreveportaquarium.com. APRIL 12-13: WOMEN VETERANS INFORMATIONAL SEMINAR. With keynote speakers, Secretary Joey Strickland, Louisiana Department of Veterans Affairs. All women veterans, active duty, Guard and Reserve are invited. Free. 6-8 p.m., April 12; 8 a.m. to 3 p.m., April 13. Wyndam Garden Inn, 1419 East 70th St., Shreveport. Email womenveteransofthearklatex@gmail.com. APRIL 13: EASTER EGG HUNT AND LADYBUG RELEASE. Easter egg hunt and Easterthemed games with prizes for children, face painting, a bounce house, photos with the Easter Bunny for $10 and rides on Roseland Express is $5. $5 per person or $20 per carload. 10 a.m. to 2 p.m. The American Rose Center, 8877 Jefferson Paige Road, Shreveport. Call 938-5402. APRIL 13: PACE’S PRIDE IN THE PARK FAMILY FESTIVAL. With food trucks on hand, various community booths to visit, vendors, live music from Tipsey and much more. 11 a.m. to 4 p.m. Betty Virginia Park, 3901 Fairfield Ave., Shreveport. Visit www.pacelouisiana.org. APRIL 13: DRESSING THE PART FASHION AND COSTUME SHOW. The annual gala to support the Shreveport Little Theatre will bring the excitement of the fashion runway and theatrical costuming to guests with a brunch buffet and live and silent auctions. $100, adults; $37.50, children. 11 a.m. to 2 p.m. Margaritaville Resort Paradise Theatre, 777 Margaritaville Way, Bossier City. Visit www.shreveprotlittletheatre.com. APRIL 13: SPRING BAKE SALE. With homemade baked goods and Yogie and Friends merchandise. 11 a.m. to 3 p.m. Petco, 6596 Youree Drive, Shreveport. Visit www.yogieandfriends.org. APRIL 13: BUGS & BREWS FESTIVAL. South Shreveport’s premier crawfish and music festival celebrating the spirit, cuisine and culture of Louisiana with crawfish from several local vendors, food trucks, live music with a Louisiana flair by multiple artists, interactive children’s area, crawfish races and more. 10 a.m. to 9 p.m. Greenleaf Park, Provenance, 1968 Bridgewater Ave., Shreveport. Visit www.bugsfest.com. APRIL 13: HIGHLAND BLOOM GARDEN PARTY. Enjoy our Highland garden that was featured on Les Tour de Jardins and join us for an evening of food, wine and fine art to support the MLK Health Center & Pharmacy. $100. 6-9 p.m. 865 Olive St., Shreveport. Visit www.eventbrite.com. APRIL 13: ANECA EASTER EGGSTRAVAGANZA. The most ginormous and free egg hunt in town with Easter Bunny photos, bounce houses, petting zoo, face painting, food trucks and more. 10 a.m. to 2 p.m. AC Steere Park, 4009 Youree Drive, Shreveport. Visit www.facebook.com. APRIL 13: ARK-LA- TEX GENEALOGICAL ASSOCIATION MONTHLY MEETING. With guest speakers John Agan and Glenda Bernard. Free. 1-3 p.m. Shreve Memorial Library’s Broadmoor Branch, 1212 Captain Shreve Drive, Shreveport. Visit www.altgenealogy.com. APRIL 15: MADAMA BUTTERFLY OPERA NIGHT DINNER. Join us for an evening of fine wine, exquisite cuisine and a fun operatic experience with the cast of "Madama Butterfly." $85. 6:30 p.m. The Petroleum Club, 416 Travis St., Shreveport. Visit www.shreveportopera.org. APRIL 16, 20, 22: BEGINNERS' KNITTING WORKSHOP. Shreve Memorial Library is partnering with knitting enthusiast Peggy Svee on this workshop for anyone who has ever considered knitting as a hobby, those just learning to knit, and for those who just need a refresher course. April 16, Free. 5:30 p.m.; April 20, Free. 11 a.m.; April 22, Free. 4 p.m. Shreveport Memorial Library, Hamilton/South Caddo Branch, 2111 Bert Kouns Ind. Loop, Shreveport. Visit www.shreve-lib.org. APRIL 16: THE COATES BLUFF NATURE AND HISTORY TRAIL-- PAST, PRESENT AND FUTURE. Jon Soul will discuss Coates Bluff’s past as a pre- European settlement and as a post-European settlement with an important role in the founding of Shreveport and Bossier. 6-7:30 p.m. Bossier Parish Libraries History Center, 2206 Beckett St., Bossier City. Call 746-7717. APRIL 16: CATS: EVENTS ON CULTURE, ARTS, TECHNOLOGY AND SCIENCE. This event brings a diverse group of scholars, leaders and artists to residents of The Glen and our community. This event will be on restoring clocks. 3 p.m. The Glen Retirement System, 403 East Flournoy Lucas Road, Shreveport. Call 798-3500. APRIL 20: EASTER EGG HUNT. An Easter egg hunt for children ages 2-10 with crafts, games and more. 10 a.m., activities; 11 a.m. Easter egg hunt. Fellowship Hall, Broadmoor Presbyterian Church, 1915 Grover Place, Shreveport. Call 868-3659. APRIL 25: AN EVENING OF WINE AND ROSES. 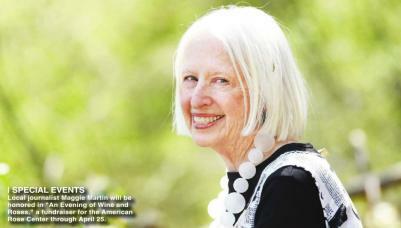 This fundraiser for The American Rose Center will honor local journalist Maggie Martin. The event includes a silent auction, live music, wine, catered dinner and more. $125. 6 p.m., social hour; 7 p.m., dinner. The American Rose Center, 8877 Jefferson Paige Road, Shreveport. Visit www.rose.org. APRIL 26: DANCING FOR A CURE. Annual dancing competition for Susan G. Komen Louisiana featuring Christian Piekos, Delano Henry, Luana Munoz, Morgan Trahant Lang and Waynette Ballengee and Vicki’s School of Dance. $50. 7 p.m. Horseshoe Riverdome, 711 Horseshoe Blvd., Bossier City. Visit www.komenlouisiana.org. APRIL 26-28: YOGA FARM FEST. With yoga, meditation, qigong, hula hooping, stand-up paddle boarding, live music, farm to table food, acupuncture, massage all in a beautiful outdoor setting. $125, weekend, or $75 each. Registration is 5-8 p.m., April 26 at Red River Brewing. 10 a.m. to 5 p.m.; April 26, 9 a.m. to 11 a.m. Perkins Property, 10560 Ellerbe Road, Shreveport. Visit www.yogafarmfest.com. APRIL 27: MUSIC IN THE PARK. With live bands, food trucks, family activities and more. Free. 11 a.m. to 6 p.m. Southern Hills Park, 1002 Bert Kouns Ind. Loop, Shreveport. Call 834-7179. APRIL 27: 18TH ANNUAL DAVID RICE MEMORIAL ANGEL RUN & WALK 5K. Make a difference in the lives of individuals with intellectual and developmental disabilities while running and walking through the beautiful Long Lake subdivision in south Shreveport. Afterwards, enjoy fun for the whole family with live music, food, photo-fun, face painting, yoga, puppet shows, massage therapists and much more! $30-$40. Race begins at 8 a.m. Holy Angels campus, 10450 Ellerbe Road, Shreveport. Visit laholyangels.org. APRIL 27: EAST BANK RE-ANIMATION CHALLENGE. Come geek out with us for this block party and music event with a costume contest where guests are encouraged to dress up as their favorite animated character from a game, animated series, comic or animated film with a costume crawl, food, drinks and more! 5-10 p.m. East Bank District & Plaza, 600 block of Barksdale Blvd., Bossier City. Visit www.bossierarts.org. APRIL 27: COMMUNITY RENEWAL CROQUET CLASSIC. Features a croquet tournament, a scrumptious lunch from Ono’s Hawaiian Cuisine, beautiful music and fabulous fellowship – all for a fantastic cause! Proceeds benefit the Adult Renewal Academy. 9 a.m. LSUS, One University Drive, Shreveport. Visit www.communityrenewal.us or call 425-3222. APRIL 27: 8TH ANNUAL CHOCOLATE AND CHAMPAGNE. This after dinner event benefiting the Easterseals with chocolate and champagne tastings, music and dancing to the Backbeat Boogie Band, along with a silent auction, fork pull and golden ticket drawing. $100. 7 p.m. DiamondJack’s Casino Hotel, 711 DiamondJacks Blvd., Bossier City. Visit www.laeasterseals.com. APRIL 28: 7TH ANNUAL SPRING FLING. Join your neighbors with family and friends for music, food and fun. 4-7 p.m. Betty Virginia Park, 3901 Fairfield Ave., Shreveport. APRIL 30: FAMILY FOOD TRUCK NIGHT. Join us at the museum for an evening of family, food and fun with local food trucks. 5-8 p.m. R.W. Norton Gallery, 4747 Creswell Ave., Shreveport. Visit www.rwnaf.org. MAY 2: ANGEL FEST. Support Holy Angels and #GiveforGood with a celebration of music, food and friendship. Live music throughout the evening accompanied by tasty eats, refreshing drinks and family-friendly activities. Free admission with a suggested donation of $25. 4-9 p.m. at Provenance Community in Shreveport. Visit laholyangels.org. MAY 3: TACO WARS 2. This free family event will feature 12 local taquerias who will battle for the Golden Taco with free chips and salsa tasting along with free screenings of CoCo and Three Amigos as well as live music and more. 5-9 p.m. LSU Shreveport, 1 University Place, Shreveport. Visit the page on www.facebook.com. MAY 3: 21ST ANNUAL LSUS ALUMNI CAPITAL ONE PILOTS GOLF CLASSIC. A day for great golf, great prizes! $750 for a four-person team with two meals, snacks, beverages, range balls and more. 9 a.m. to 6 p.m. The Golf Club at StoneBridge, 301 StoneBridge Blvd., Bossier City. Visit www.lsus.edu/golf. MAY 3: 11TH ANNUAL ULM WARHAWK CLASSIC GOLF TOURNAMENT. A four-person scramble with a shotgun start with lunch, gift bags, door prizes and more. 10 a.m., registration; 11 a.m. lunch. $100. Northwood Hills Golf Club, 5000 Northwood Hills Drive, Shreveport. Call 797-9556. MAY 4: CHILDREN'S BOOK FESTIVAL. Shreve Memorial Library hosts this family-friendly, literary event with children’s book authors and illustrators, costumed characters, fun games and activities for kids and food vendors. Free. 10 a.m. to 4 p.m. LSU Shreveport Campus, 1 University Place, Shreveport. Visit www.shreve-lib.org. 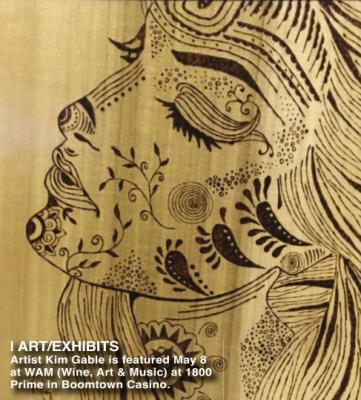 MAY 8: WAM (WINE, ART & MUSIC). This quarterly event features local artist Kimberly Gable, wine tastings, food pairing and live music. $35. 5:30-8 p.m. 1800 Prime Steakhouse, Boomtown Casino, 300 Riverside Drive, Bossier City. Visit www.bossierarts.org. MAY 9: P.R.I.D.E AWARDS. The banquet recognizes excellence in the tourism and hospitality industry presented by the Shreveport-Bossier Convention and Tourist Bureau. Nominations close at midnight, April 23. 5:30 p.m. cash bar; 6 p.m. dinner awards. Horseshoe Casino and Hotel Riverdome, 711 Horseshoe Blvd., Bossier City. Visit www.Shreveport- Bossier.org/pride. MAY 11: IMAGINE ACHIEVE BELIEVE. This inaugural gala for Shriners Hospitals for Children - Shreveport will feature dinner, program and live/silent auctions. $125. 7 p.m. Eldorado Resort Casino, 451 Clyde Fant Parkway, Shreveport. Visit www.shrinershospitalsforchildren.org/ shreveport. MAY 11: ARK-LA-TEX GENEALOGICAL ASSOCIATION MONTHLY MEETING. With Leonard Gresens’ presentation on “Early Shreveport/ Bossier Private Coinage.” Free. 1-3 p.m. Broadmoor Branch Library, 1212 Captain Shreve Drive, Shreveport. Visit www.altgenealogy.com. MAY 21: CATS: EVENTS ON CULTURE, ARTS, TECHNOLOGY AND SCIENCE. This event brings a diverse group of scholars, leaders and artists to residents of The Glen and our community. This event will be on growing and tasting tomatoes. 3 p.m. The Glen Retirement System, 403 East Flournoy Lucas Road, Shreveport. Call 798-3500. JUNE 18: CATS: EVENTS ON CULTURE, ARTS, TECHNOLOGY AND SCIENCE. This event brings a diverse group of scholars, leaders and artists to residents of The Glen and our community. This event will be on Astronomy 101. 3 p.m. The Glen Retirement System, 403 East Flournoy Lucas Road, Shreveport. Call 798-3500. BOOMTOWN CASINO & HOTEL: 300 Riverside Drive, Bossier City, 746-0711. www.boomtownbossier.com. April Promotions. Night of 100 Winners Drawings is from 7-10 p.m. every Friday. Ten winners every 20 minutes. Press 2 Win Kiosk Game is from 5-9 p.m. every Wednesday. 5X Entries for Night of 100 Winners is every Monday and Tuesday. Guest will earn 5X entries. Excludes April 15, 16. Play and Eat Buffet Promotion is every Monday and Tuesday (excluding April 15,16). Guest earn 150 tier points on Monday or Tuesday to receive a free buffet to redeem Wednesday through Sunday. DIAMONDJACKS CASINO & RESORT: 711 Diamondjacks Blvd., Bossier City. 678-7777. See Rewards Club for details. Restrictions apply. New Member. Receive up to a $100 refund in the mail. Mail offer based on play. Happy Birthday. Come in on your birthday, swipe your Rewards Club card and receive a present from us. April Promotions. $20,000 April Showers Giveaway. Win $2,500 cash instantly. Win your share of $20,000 cash and JackPlay. Drawings from 7-10 p.m. every Friday. 50+ Diamond Club is every Wednesday. New Kiosk Rewards Program. Turn your play into Rewards right at the kiosk! Now you can easily manage and redeem your points. Your points earn you slot play, food and cash. New Rewards Club Benefits. New enhanced benefits, exclusive points multiplier and more! Manage your own rewards with our New Kiosk Rewards Program. Your email could be worth $100. Submit your email to the Rewards Club for a chance to win a share of $500!. LEGENDS BUFFET SPECIALS: Salute to our troops. 25% off every day at Legends Buffet. Must have military I.D. to receive discount. Not valid on holidays. Cannot be combined with any other offer. $26.99 Crawfish Buffet is from 4:30-10 p.m every Friday. All-you-can-eat crawfish buffet. Price with Rewards Club Card. $9.99 Thursday buffet with Rewards Club card. $7.77 Senior Dinner Buffet is every Wednesday for guests 50 years and older with five slot points. Easter Buffet with allyou-can-eat holiday buffet for $16.99. Price with Rewards Club card. Tax and gratuity not included. ELDORADO RESORT CASINO: 451 Clyde Fant Parkway, Shreveport. 877-602- 0711. April Promotions. $95,000 Roads to Riches. Mystery Multiplier is every Thursday. Play between 10 a.m. and 10 p.m. and win bonus entries. The finale drawing is June 29. Play daily for your chance at cash and prizes! Simply earn five tier points to unlock that days game and win Reward Dollars and prizes, including additional entries into the Finale Drawing! Twenty lucky guests will win $500 cash while one lucky guest will drive home in a brand new 2019 Jaguar F-PACE SUV! $20,000 Super Slot Sundays. Just when you think Sundays are Super, it gets better! Play in our Super Sunday Slot Tournament every Sunday in April. Play anytime between 1 p.m. and 5 p.m. each week for your chance at a share of $5,000! $20,000 Spring into Cash is every Friday. Play every Friday this month for your chance at a share of $5,000, Ten guests will win prizes ranging between $1,000-$250 each week! Drawings begin at 8 p.m.
HARRAH'S LOUISIANA DOWNS: 8000 E. Texas St., Bossier City. 742-5555. Must be 21 years of age or older to participate. Return Rewards. Caesar's Rewards Members that earn 100 Tier Credits in a day will receive at least $5 in Free Slot Play. Mystery Reward Credit Multiplier is Tuesday and Wednesday. Caesar's Rewards members can swipe their card at the Promotions Kiosk to receive a Reward Credit Multiplier. Caesar's Rewards members have a chance to win up to a 100X multiplier. $12,000 Spring Cha Ching Drawings is every Saturday. Caesar's Rewards members can swipe their Caesar's Rewards card for a chance to win a share of thousands in Free Slot Play. Activation is from 3-9:45 p.m. All Caesar's Rewards members receive one free entry upon activation; additional entries are based on Tier. At 4 p.m., drawings will begin and happen every half hour. Fuddruckers Special Earn 100. On Fridays and Saturdays, Caesar's Rewards members who earn 100 Tier Credits can receive a complimentary meal voucher for a burger, fries and a drink at Fuddruckers (max value $20). Caesar's Reward members must swipe card at a redemption kiosks to receive their dining credit which is valid for seven days. HORSESHOE BOSSIER CITY HOTEL AND CASINO: 711 Horseshoe Blvd., Bossier City. 742-0711. April Promotions. Mystery Reward Credit Multiplier. On Mondays and Tuesdays, Total Rewards members can swipe their Caesar's Rewards Card for a chance to win up to a 100X Multiplier or a 3X multiplier for Video Poker. Guests can swipe their Caesar's Rewards card at any Promotional Kiosk. Asian 3K Drawing. On Mondays, Caesar's Rewards members can swipe their Caesar's Rewards Card to activate their entry into the drawing between 7-11:45 p.m. in the Mini Baccarat area. Drawings happen every half hour starting at 8 p.m. with the last one at midnight. One winner will be announced to receive promotional chips or Free Slot Play. Asian Midweek Drawing. On Wednesdays, Caesar's Rewards members can swipe their Caesar's Rewards Card to activate their entry into the drawing between 7-11:45 p.m. in the Mini Baccarat area. Drawings happen every 15 minutes starting at 8 p.m. with the last one at midnight. One winner will be announced to receive promotional chips, Free Slot Play or a Visa Card. As Seen on TV Gift Series. On Wednesdays, guests must earn 150 Tier Credits to receive a gift each week. Earning period is from 5 a.m. to 7:30 p.m.; gift distribution is from 3-8 p.m. $100,000 Legendary Fourtunes Drawings. On Fridays and Saturdays you can win a share of $100,000 cash. Five winners will be selected every hour from 6-9 p.m. to receive $500 cash. At 10 p.m., one winner will be selected to win $1,500 cash. 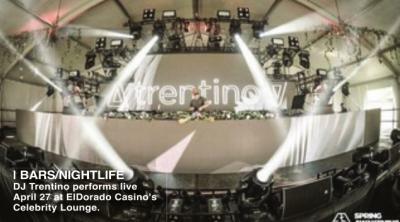 Activation is from 5-9:45 p.m. $100,000 Legendary Fourtunes Second Chance Drawings. At 9 p.m. on select Thursdays, someone will walk away with $1,500 cash and any remaining unclaimed prize cash from the previous weekend’s Legendary Fortunes Drawing. Activation is from 5-8:45 p.m. Asian Mini Baccarat Tournaments are Friday in April. MARGARITAVILLE CASINO AND RESORT: 777 Margaritaville Way, Bossier City. 855-346-2489. www.margaritavillebossiercity.com. April Promotions. Margaritaville Millions Continuity Game is every day with Island-themed game with the appeal of more winners, more often. Play ‘N’ Get Umbrella is Monday through Thursday. Four hundred base points available while supplies last. 2X Play Wednesdays. Guests receive two free game plays. $20K Mini Baccarat Hot Seat is April 11, 18, 24. Drawings are 8-11 p.m. Two winners will be drawn every 15 minutes for $200 in promotional chips. All Access members will receive $400 in promotional chips. $25K Around the World Giveaway is April 14, 21, 28. Drawings are 8-9:45 p.m. Two names are drawn every 15 minutes for $250 in promotional chips and an entry ticket into the finale drawing. $11K Checks in the Mail Giveaway is April 12, 13, 19, 20, 26, 27. Five names will be drawn every 30 minutes from 8–11:30 p.m. to pull a “check” from the designated mailboxes. Prizes range from $100 - $1,000 in cash. At midnight, one name will be drawn to make a selection and in addition, they will take all forfeited amounts from the mailboxes. $25K Jackpot Party is April 27. For every jackpot hit, guests will receive variable entries based on tier.